Native plant cultivars are a vexing topic. My experience has been that gardeners who are increasing their use of native plants are likely to find the topic of native plant cultivars to be confusing, and for good reason. There is a tremendous amount of variation in the traits for which cultivars are maintained, how the cultivars originated, and in how cultivars are propagated. Echinacea ‘Coconut Lime’ cultivar, courtesy American Beauties. Most people take the term “cultivar” to be a contracted version of the phrase “cultivated variety”, a phrase which carries with it the structure of a most basic definition. Cultivars are plants which are selected and/or bred by humans based on one or more specific traits, and which are then propagated in such a way that those traits are maintained. In other words, cultivars differ from “typical” examples of the plant species to which they belong AND that difference is important enough to somebody that the person is willing to expend time and energy to preserve the difference. Cultivars are often maintained because they have an unusual flower color, leaf color, growth habit, or disease resistance. There are three different ways in which a cultivars can first arise. The first, and oldest, method is selection, in which an individual plant (or population of plants) naturally exhibits an atypical appearance or behavior. Someone notices, and propagates that plant in such a way that the atypicality is preserved. The second method is hybridization, in which two different species or varieties of plants are bred and their offspring is propagated. Some cultivars are naturally occurring hybrids, found in nature at the boundary between two closely related species, but many cultivars are created at nurseries by plant breeders. The third method is genetic engineering, in which humans directly manipulate the DNA of plants to produce some desired trait. If we limit our attention to cultivars of native plants, we can ignore genetic engineering since it is restricted – because of expense – largely to medical, industrial, and agricultural applications. Most cultivars of native ornamental plants are either selections or hybrids. Finally, there are two basic ways that the valuable traits of a cultivar can be maintained: the cultivar can be propagated through cloning or it can be grown from seed. Most cultivars of native plants (about 70%) are genetic clones, which means that each plant has exactly the same DNA. The clones are grown by cuttings, by division, or by tissue culture. Some cultivars will grow “true” to seed, which means that seedlings will have the same important trait as the parent. Okay, that’s a lot of background: why does any of it matter? When you are trying to decide on a native plant for your garden, all of these details can potentially help you decide whether or not a cultivar is the “right” choice for you. 1. Cultivars look different. Almost by definition, cultivars do no look like “normal” or “typical” examples of a plant species. If they did, there would be no need to mess with a cultivar. Whether or not this matters to you is, well, up to you. If you want to plant Ilex verticillata, or Winterberry holly, but the ten foot mature height is a problem then maybe the cultivar Red Sprite – at a mature height of four feet – is exactly what you want. On the other hand, if your goal is to accurately represent the native flora of your site then a dwarf cultivar may be suboptimal. 2. Cultivars have less genetic diversity. This is a tricky one, because there are no hard-and-fast rules: even some plants that are NOT marketed as a cultivar are actually propagated clonally: if you care about genetic diversity, you have to ask your grower whether the plant was grown from open-pollinated seed (and make sure your grower has a firm and nuanced understanding of what this means). Open-pollinated seed collected from remnant wild populations is the gold standard, but not common. Genetic diversity is a valuable insurance policy, since a diverse population has an increased probability of resisting threats from disease and/or pests. Another wrinkle is plant gender. 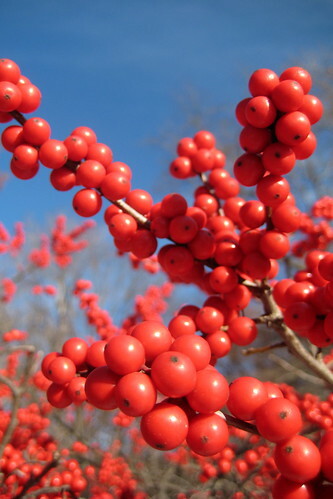 In some cases, like our native inkberry (Ilex glabra), every single commercially available cultivar is female. Without male plants around, there will be no fruit on these hollies. 3. Cultivars behave differently. Because cultivars have been selected primarily on ornamental traits, it is not always clear whether or not they perform the same ecological role as the native plant species. In many cases they do not. For example, Echinacea cultivars have become nearly a fad and some examples are quite bizarre in color or in flower shape. These Echinacea cultivars are sometimes sterile (bad news for goldfinches, who want the seed) and often have a “doubled” flower form (bad news for pollinators, who can’t effectively reach the pollen and nectar). 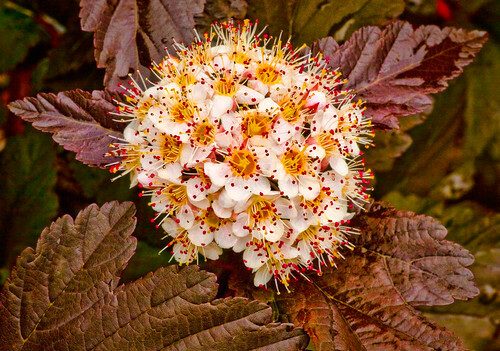 Another example is Eastern ninebark (Physocarpus opulifolius), the most popular cultivars of which were selected for dark (i.e. purple) foliage instead of the normal green. It turns out, the “improved disease resistance” of the dark-leaved cultivars like Diablo and Summer Wine results from the specialist native ninebark beetle (Calligrapha spiraeae) finding the cultivars to be an inferior host, since the leaf chemistry of the cultivars differs in important ways from the species. Another potential problem with native cultivars is fruit (e.g. berry) size: many culitvars were selected for bigger and/or more fruit, which may be nice to look at but may also be inedible to wildlife. So, what is a native plant gardener to do? I have planted, and will probably continue to plant, cultivars of locally native plants. However, my first choice will always be a locally-sourced open-pollinated seed-grown plant. My second choice will be a cultivar that maintains the flower shape, berry size, and leaf color of the species. My goal is to never buy cultivars that exhibit radically different flower shape or color, but I will knowingly buy dwarf varieties which are otherwise similar to the species. And when I see a cultivar touted as resistant to insect damage, that one gets an automatic rejection. I also pay extra attention to observing my cultivars in the garden: if I don’t see pollinators on the flowers, or insect damage on the leaves, or birds eating the fruit then I am quite likely to rip out the cultivar and try the species. This is my policy because my primary motivation for using natives in the first place is that I want to support my local ecology. If I can’t see evidence that a cultivar is helping me accomplish that goal, I fire it and hire a plant that will. Thanks for this information! Someone just shared it in our group, Gardening with Nature in Mind.